5 Health Care Websites and Their Impressive Features. When seeking information about a hospital or medical professional, I always start my search on their website. Unfortunately if that website does not catch my attention or is not user friendly, I generally turn away within the first couple of seconds. The 5 websites that I highlighted below include a combination of eye catching design and great functionality to enhance the user experience. 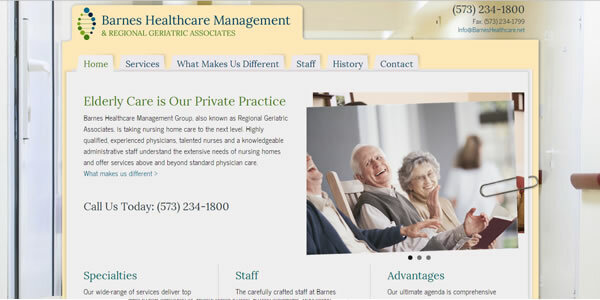 The website for Barnes Healthcare Management has a unique style that builds the trust of their preferred audience. The website colors are warm and friendly. They bring a sense of calm to the site. The site is designed with a nice 18 point font which enhances the legibility for the sites older audience. The tabbed navigation makes its really easy to understand where to click next. The images of smiling people used throughout the site continue the warm and friendly theme. I would revisit the background. I feel that the image of the medical facility really hurts the design. What little you see of it, distracts the eye drawing the attention of the reader away from the content. This is especially true on the longer page where the background does not stay stationary. 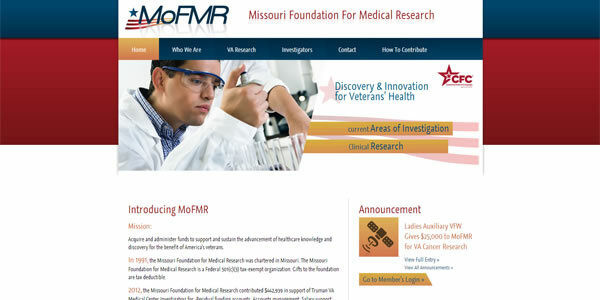 The website for Missouri Foundation for Medical Research uses color to move the eye and grab the emotions of the reader. The design uses the Red White and Blue to grab the readers feelings of patriotism. The gold color draws your eye to the important Areas of Investigation and Clinical Research buttons. The navigation is large and easy to navigate. The macro image of the researcher communicates the sites core message. The lack of sidebar on the investigators page enhances the readers visit by not requiring them to scroll as much. This site has two things that I really want to change. The logo should have a link applied to it so when it is clicked, the user is returned to the home page. In addition, the page layout of the Current Areas of Investigation page should be reformatted into a series of titles and paragraphs. Doing this will greatly enhance its legibility. 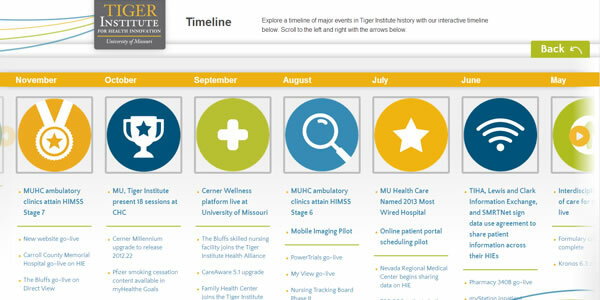 The website for the Tiger Institute for Health Innovation uses bright colors and large chunky icons to assist in communicating the organization’s mission. The bright colors bring a feeling of energy to the site. The home page has a section highlighting the latest blog posts. The big chunky icons draw the reader’s eye to important things throughout the site. The timeline utilizes the same chunky icons in a horizontal timeline structure to highlight key points in the organizations history. The colored swooshes are a nice way to frame the content of the site. Although the rotating images of the doctor and the hospital are nice, it feels like there should be more slides included. The website for Barnes Jewish Hospital in St. Louis, Missouri makes a great first impression. It’s information is well organized and easy to find. The large image slider on the home page brings a personal touch to highlighting their lead in areas of the health care industry. The generous use of white space makes the main navigation easy to scan and find what you need. 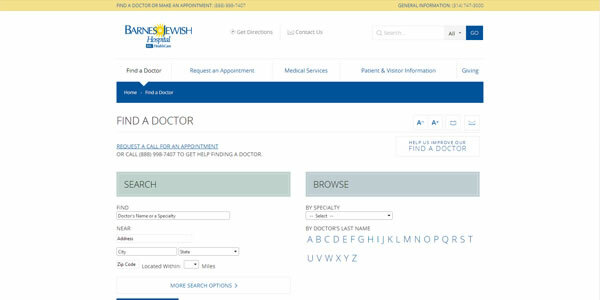 The first button on the navigation is to find a doctor, which is the most important part of any hospital website. The physician search has a unique feature allowing you to quickly search by clicking a letter. The physician search also allows you to jump from one doctor to the next without starting a new search. The complete site search provides an additional option for finding information. Some subtle textures would be a nice design element to break up the large expanses of color. 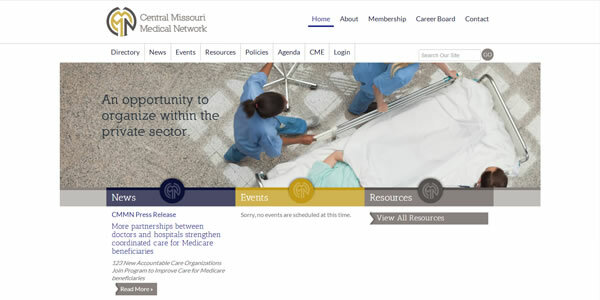 The website for Central Missouri Medical Network provides physicians the ability to share their collective knowledge helping to work through the ever changing landscape of the medical industry. The home page image slider has some large emotion grabbing images. Those large images are echoed in the header of each of the sub pages. The logo is used throughout the site to enhance the brand of the organization. The site has a membership function that allows physicians to join the organization on the website. It also provides the members the ability to post events and other networking opportunities. A visit to a healthcare industry website should be warm and welcoming. You should be able to find the information you need within a few clicks. The websites I have highlighted all provide that functionality plus much more. How can you improve the information architecture and design of your healthcare industry website?